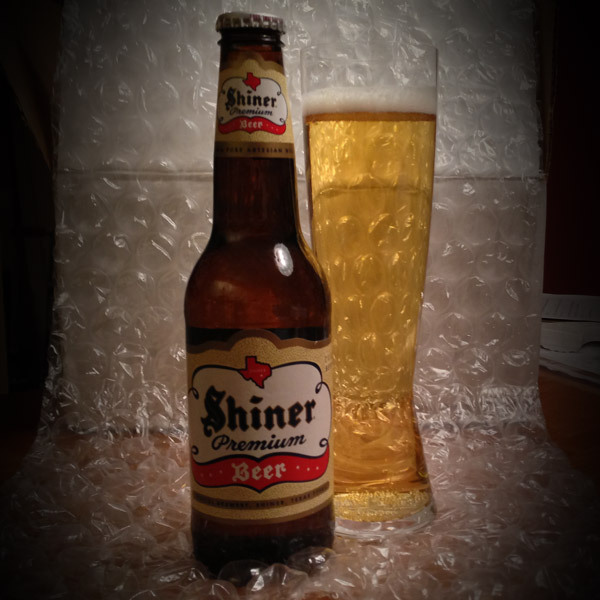 You are here: Home » Shiner Premium: What if Budweiser Was Good? The folks at the Spoetzl Brewery in Shiner, Texas send beers my way from time to time, and honestly, many of their gentle offerings are lost on my gonzo craft beer sensibilities. But I’m glad they kept the brews migrating north, because every once in a while a gentle beer is just what it takes to open my mind to the possibilities of what beer can be, and the taste of Shiner Premium – the new “old” name for what was most recently called Shiner Blonde – has done just that. This 4.4 percent ABV Bohemian-style lager is not a complicated brew. It’s a light pop of peppery hops, followed by a little nugget of toasted caramel, followed by a fairly dry and un-dramatic hop finish. The flavor is over almost before it begins, and the only thing I remembered was that little toffee hit in the middle. A BJCP guru (or tons of folks over at BeerAdvocate where it scores a middling 69) will certainly be able to pick it apart, but here’s the thing – I like it. I like it a lot. I found it to be quite pleasant, and sometimes that’s enough. It got me to thinking what it might be like if Budweiser made a lager that hadn’t spent decades being whittled down by bean counters and pumped full of adjuncts by brewmasters who value consistency over all else. Unlike Budweiser, Shiner Premium has flaws, but the way I see it, an agreeable flaw is the same thing as character. And I think that’s what sets this beer apart from Budweiser – it tastes like it was made by people, not by machines. While that’s a romantic notion (and probably inaccurate – Spoetzl isn’t exactly brewing on a thirty barrel system), it paints a nice picture in my head as I drink the beer. Anyway, sipping on a Shiner Premium has sent my mind to wondering what might have happened if the American brewing industry hadn’t been so eager to turn their products into commodities so many years ago. What if they stuck to the principles and recipes of their original formulas? What if a young Adolphus Busch, fresh from the Civil War and with his inheritance burning a hole in his pocket, set out to make a great beer, and not a “national beer”? I guess we’ll never know, and just like I look back on my life and think “what if,” I quickly shake those thoughts off because I consider myself to be very lucky to have such a wonderful life today. Any little changes might disrupt the whole thing, and I don’t want Don disappearing if I don’t make my parents kiss at the Enchantment Under the Sea dance! For better or worse, the dark days of the American beer industry were the crucible for the craft beer boom we’re all enjoying today. I wouldn’t change a thing if it meant that there’d be no willing audience for Sam Calagione’s crazy beers or no Stone’s Enjoy By IPAs, or even no Shiner Premium, a beer that may have survived because folks were looking for something more “real” than the false King. I guess what I’m saying is thank you for sucking, Budweiser. We couldn’t have done it without you. Beers like this are the equivalent of table wine in Europe. Henry Winehard makes a lot of these ‘middlin’ beers–beers that I like a lot on a daily basis. Its because they’re not hop or malt bombs that we can go back to them every day–they don’t pall like some of the heavily flavored beers do, yet they always provide good solid quality. Yup – nothing fancy, just a good, drinkable beer made with decent ingredients. Not for me. I want enough hops to make me think I’ve been put through electric shock therapy. Me too, mostly. I’m currently enamored with Stone’s line of “Enjoy By” IPAs. Any beer that commands me to drink it as quickly as possible is alright with me! I think we’ve had this discussion before and I believe we agreed it has something to do w/ age. People usually mellow w/ age and their tastes tend to mellow w/ them. I enjoy a good hop bomb as much as the next guy (especially if its a rye hop-bomb), but I don’t want one every time I sit down to drink a beer, not even every second or third time. One of these days you’ll write something I don’t agree with. This isn’t one of these days (but there are still plenty of hours left for a surprise). I doubt I’d like Shiner Premium and can’t say I’ll be on the lookout for it. Iv’e only “enjoyed” one of their brews – FM69 Farmhouse. For the most part, I think Spoetzl is the Texas equivalent of Yuengling, though with a wider, if uninspiring lineup. As for what would happen if Budweiser was good, well, isn’t that what Black Clown is all about. I mean, it was brewed with us in mind, wasn’t it? The ultra cool Eyes Wide Shut-esque ads say so. In a way you’re right – Black Crown is an all-malt version of their regular beer. I love that they’ve finally done the very basics right (not using adjuncts in beer) and they expect people to get excited about it. That’s like me wanting heaping praise from my wife for remembering to put my beer glass in the dishwasher. I’m simply glad Spoetzl exists, what with me living in a virtual beer desert here on The High Plains o’ New Mexico. Their beers are generally available here, as are some craft beers from nearby Colorado. Other than that… we don’t get much, if any, of the good stuff you guys on the Right Coast enjoy. A Spoetzl Family 12-pack has been known to grace my fridge quite often… that Lil Ol’ Brewery In Texas does some pretty good work. Where are you in NM? I’m surprised to hear that you can’t get many of the SoCal or AZ brews. Some nice offerings from Four Peaks, San Tan and others in Arizona and I don’t need to mention any of the San Diego/West Coast hop bombers. What about some of the legitimate TX craft brews like St. Arnolds, Live Oak, or Jester King? I’m in Portales, Alemonger. None of the beers you mention are available here, but I’m thinkin’ they would be if I were in ABQ or Santa Fe. P-Ville is quite a small burg: roughly 13K people, and a stone’s throw from the TX state line..
Have you ever had A Shiner Prickly Pear?